Young people from across the country, and even around the world, come to Indiana Bible College to allow God to shape their hearts by the Word of God. In addition, the outstanding college faculty and curriculum shape these young people into future ministers and workers for God’s Kingdom. We invite you to take a look inside the Indiana Bible College ministry; who we are, what we offer, and what we stand for. Then, if you like what you see, we hope you will allow God to shape your own life through the IBC experience. Check out what campus life is all about. Indiana Bible College is an endorsed ministry of the UPCI. We subscribe to, believe, practice and teach the Doctrine of the United Pentecostal Church International. Indiana Bible College has been located in the city of Indianapolis for the last 30 years and is subsidized by Calvary Tabernacle. Under the direction and vision of Pastor Paul Mooney, IBC has trained hundreds of preachers, missionaries, youth workers and music ministers. The story of Indiana Bible College is truly a miracle. Take a few minutes and relive the sacrifice of Calvary Tabernacle as they prepare for the first year of IBC. From getting classrooms and dorms ready to mowing grass and yard work, the congregation of Calvary Tabernacle has always believed in the vision of Indiana Bible College. Will I receive a quality education at IBC? IBC is committed to providing a quality Bible-based education whether accredited by a government approved agency or not. The faculty at IBC is comprised of a highly capable and diverse staff. Eight of our instructors hold graduate degrees. Others hold bachelor’s degrees and/or bring to the classroom years of experience in denominational leadership, pastoring, evangelism and outreach, church planting, music ministry, youth ministry, writing, publishing, and world missions. IBC’s standard of excellence is further evidenced by the fact that IBC credits have been accepted on a case by case basis by numerous colleges across the country, as well as the testimony of IBC alumni who have been accepted straight into graduate degree programs after graduating from IBC. It is the unique and primary mission of IBC to produce anointed men and women ready to meet the challenge of reaching the lost and impacting worldwide revival. If IBC is able to achieve accreditation through a viable accrediting agency without compromising doctrine or giving up effective ministry training methods or anointed, seasoned ministers as instructors, IBC will do so. If not, IBC still remains first and foremost committed to anointed and quality training for Apostolic ministry. What if I already have a degree from a secular institution but feel called to ministry or a deeper study of the Bible? IBC has designed two programs to serve students who have already pursued secular educations. These programs provide the firm foundation of the Bible and ministry training unique to a Bible College education without requiring an additional four years of college. IBC’s One Year Bachelor’s (OYB) program is open to students who have received a bachelor’s degree (approximately 120+ credit hours) from a secular institution. This accelerated degree track allows the student to concentrate their studies by taking primarily upper-level courses. This BA in Biblical Studies program requires 38 credit hours and can be completed in just two semesters. IBC also offers an accelerated program tailored to students who have completed an associate’s degree (approximately 60+ credit hours). This Two-Year Bachelor’s (TYB) program requires the student to take 64 credit hours, which includes pre-selected Biblical Studies courses as well as several electives. This degree program allows the student to graduate with a BA in Biblical Studies in only two years. 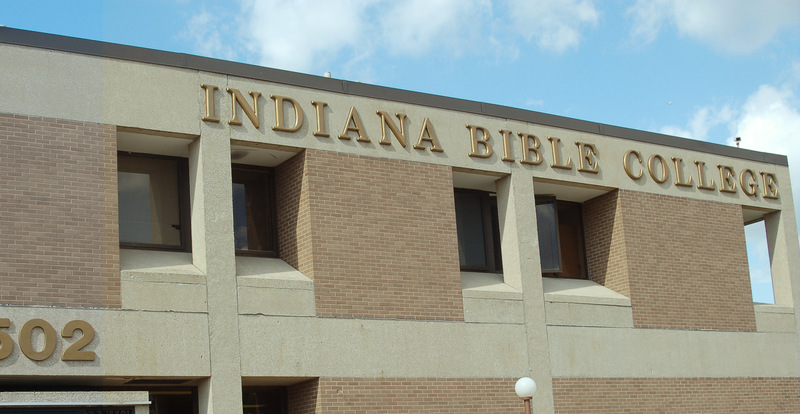 Is Indiana Bible College accredited? IBC has not yet applied for accreditation. Commitment to our Apostolic Doctrine is among the primary reasons for not doing so. Government recognized religious accrediting agencies such as the Association for Biblical Higher Education (ABHE) and the Transnational Association of Christian Colleges and Schools (TRACS) which accredit undergraduate Bible colleges require Trinitarian statements of faith. Commendably, our Apostolic Bible colleges have refused to compromise the Oneness Doctrine for accreditation. If such agencies ceased requiring applicants to ascribe to Trinitarian doctrines, IBC would pursue accreditation through them, as would other Apostolic Bible colleges. What if I want a degree that prepares me for a secular profession? There are many institutions much better equipped to train students for secular vocations than a Bible college whose focus is Biblical study and the training of preachers, teachers and ministers. In most cases, such institutions can be found near a student’s home church. There a student can obtain a quality secular education and still remain connected to their local church where they will receive the sound doctrinal teaching and pastoring they need while pursuing a secular career. IBC also has many students who may ultimately want to pursue a secular profession but feel led to attend Bible college for a period of time to search out God’s call on their life and/or obtain a deeper understanding of the Bible and ministry. Often such students go on to receive their degree from a secular institution and enter a professional career. However, because of the training and grounding received during their time at Bible college, these individuals are often more responsive to the needs of the ministry and become greater assets to their local church. What do IBC Worship Studies Majors do after graduation? Most parents ask, “What can be done for employment with a Bachelor of Worship Studies Degree?” Our music major graduates do not have trouble finding full-time positions in music ministry if that is what they desire. Some have positions waiting for them at their home church when they graduate. If that is not a possibility, with the counsel and full support of the student’s pastor, we help place our graduates in music ministry positions. We receive several calls every month from pastors across the country seeking music ministry leadership for their church, and many of these are full-time positions. Some of our music graduates also feel a call to preaching or teaching ministries. We have alumni in serving full-time as Pastors, Youth Pastors, and Christian School teachers and administrators. A growing number of our students are continuing their education into master’s programs at accredited colleges. Some of our graduates are working in the music recording industry, in the music publishing industry in Nashville, as recording artists, or with traveling music groups. What is the difference between the Worship Studies Major and Worship Studies Minor Degree? The Bachelor of Arts in Worship Studies major with a minor in Biblical Studies is comprised of approximately 64 music hours and 64 Bible and Theology hours. The Bachelor of Arts in Biblical Studies with a minor in Worship Studies is comprised of approximately 32 music hours and 70 Bible and Theology hours. The Worship Studies minor degree plan also requires the student to complete some course work in the Religious Education, Social Science, Ministry, International Studies and Communications & Media departments at IBC. The Worship Studies minor degree is designed for IBC students who feel a call to preach and are gifted musically. Can I transfer college credit to IBC towards a Worship Studies Major or Minor Degree? Yes. Any previous college credit with a grade of a C or higher is considered for transfer credit. We try hard to use any previous credit that will fit into the degree plan that you choose at IBC. If you are a Worship Studies Major or Minor some of the classes that usually transfer include Speech, English, Psychology or Sociology, Bible and Music classes. Minors can transfer some business, education, and international type classes. To know exactly what will transfer for one of the music degrees, a personal evaluation will have to be completed by the IBC Dean of Music. Can I “test out” of any of the introduction level music classes? We are certainly happy to administer a test to determine if a student is capable of passing the first year music classes. Theory 1-2, Dictation (Ear Training) 1-2, and Sightsinging 1-2 are the classes that the IBC Worship Studies Majors may attempt to pass. Do I have to be able to read music or play the piano? These are skills that music majors will learn while at IBC. Obviously, any previous music education or experience will help you. However, our piano lessons are private so that one of our wonderful piano instructors can gear the lesson to your level. These lessons are designed to help the student be able to play by note, read a chord chart, and play by ear. If you are a beginner, you will be expected to work really hard and show progress quickly. All piano students are required to practice a minimum of six hours per week. What is the audition process for the IBC Chorale? The IBC chorale is a select group that performs at several community events around Indianapolis and during the two annual chorale tours. Students who want to be a member of IBC Chorale must audition vocally. In addition, returning chorale members must re-audition each year. The candidates should use a soundtrack and select a song that demonstrates the best qualities of their voice. Students who play a musical instrument will also be asked to audition on their instrument. The music faculty judges the vocal performance on a variety of characteristics including tone quality, intonation, breath support and proper diction. What is the audition process for IBC PRAISE? The initial step for the IBC PRAISE audition is the Chorale audition. Those who score highest on the chorale audition are called back for PRAISE auditions where specific songs are assigned. Returning IBC PRAISE members in good standing with the academic and financial offices can remain in the group without another audition. IBC PRAISE members who complete a year as a member of the group receive a $500 scholarship for the next fall semester. Will I have an opportunity for Music Ministry experience my first year at IBC if I don’t make Chorale or IBC PRAISE? YES! The 200-voice IBC Choir is open to all students. No audition required. The IBC Choir sings annually at the Mid America Revival Conference and the IBC Music Fest. The choir also sings one Sunday night per month at Calvary Tabernacle and at various community events including events held during REALITY, our intense evangelism week that includes an outreach service on the circle in the heart of downtown Indianapolis. Many other performance opportunities are available to IBC Students. Some of these include the IBC Singers, IBC Chapel Services, IBC Accent at Calvary Tabernacle, MSA trips, Freshmen Chapel, Nursing Home Services, the IBC and Calvary Tabernacle Orchestra, the IBC Recording Studio, and other in-house bands. Do you offer any Music Scholarships? Each year the IBC Music Department awards two half-tuition scholarships for incoming freshmen. To be considered, you must submit a scholarship application by April 1. The scholarships are renewable each semester until graduation. Scholarship students must maintain a 3.0 GPA and are required to work in the IBC Worship Studies Office for three hours each week. To request a scholarship application, please call 317-554-8069 Ext. 222 or e-mail WorshipStudies@go2ibc.com.